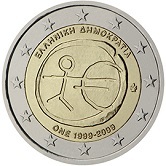 Details relating to the Joint EU Commemorative of 2009. 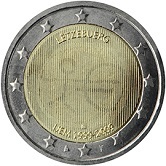 This is the second joint issue where all the existing members of both the EU and the Euro zone issued at the same time basically the same coin, only differing in the issuing country designation. 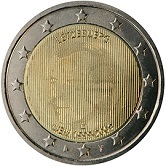 Although the physical euro coins only came into circulation at the beginning of 2002, the Euro was used by the financial institutions from 1st January 1999. 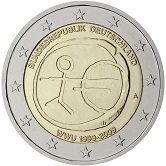 The inner circle shows a symbolic representation of EU financial relationships developing from primitive trading, (the primitive representation of a person, apparently on a stone background) to an Economic and Financial Union (the Euro symbol € ). The name of the issuing country appears at the top of the inner circle. The initials of the designer (ΓΣ) appear at around five o’clock on the edge of the stone tablet. At the bottom of the inner circle are initials standing for economic and monetary union. These are in the language of the respective countries. Following these initials we see 1999-2009. I have shown above two coins, with the normal script and one with the Hellenic script. I have also shown the Luxembourg coin as this differs because of the reasons set out above. This was produced by a process that enables the head of the grand duke to be seen when viewed from one side and the normal image when viewed from the other. Below is a table showing the different insciptions for the varios countries. Return from EU Commemorative 2009 to euro coin collector.